I’ve been making these wheels, marking in the paints in the specific brands that I have, using the ones created by Bruce MacEvoy at Handprint.com as reference. I think for me, paint mixing will be much more efficient with these in plain sight. 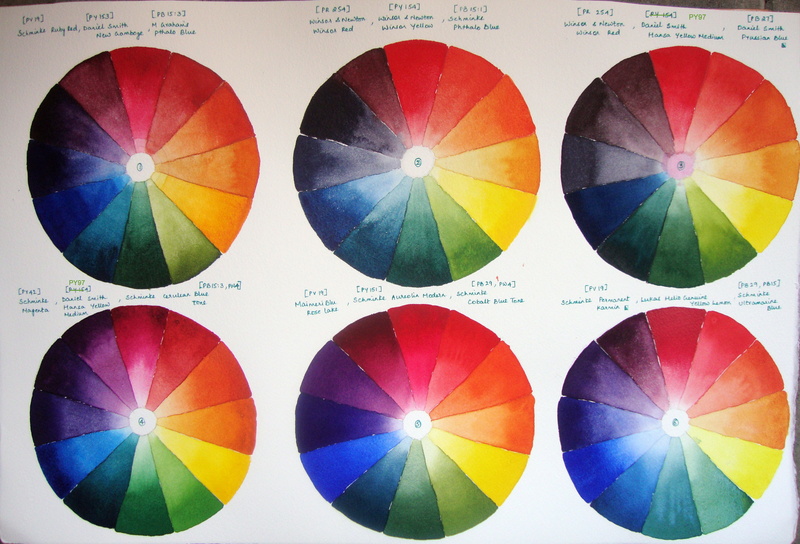 The color wheel on the right shows the most lightfast watercolor pigments available arranged according to hue angle. The coolest yellows are at 90degrees like cadmium lemon PY 97 and green gold PY 129, moving clockwise from there, are the warmer yellows like azo yellow PY 150 and gamboge PY 153. The unsaturated yellows lie within the wheel, the closer to the center point of the circle, the more unsaturated they are. These are the iron oxides like raw sienna, raw umber, burnt sienna, burnt umber etc PBr7, PBr 11 ..along with a variety of mixtures. Then we move onto the oranges like pyrrol orange PO 73 and red oranges like pyrrol scarlet PO 255 which are the most saturated pigments we have available right now. Maimeri burnt umber is an unsaturated red orange. Then come the reds like the cadmiums and quin reds PR 108 and PR 209. PR 179 perylene maroon is a beautiful unsaturated red. Quin magenta and quin violet PR 122 and PV 19 are saturated and unsaturated hues of magenta lying at 360 degrees. Cobalt violet and manganese violet PV 14 and PV 16 are saturated and unsaturated versions of the red violet hue at 330 degrees. Ultramarine violet PV 15 red shade is a violet at 300. I have a violet blue which is marketed as smalt by WinsorNewton at 270 degrees. There are not that many lightfast pigments available in this region, I have yet to acquire a nice, juicy good saturated violet. The red blue like ultramarine blue PB 29 comes next, then a true blue like cobalt blue PB 28 which comes close to the color of the sky , greener blues like pthalo blue PB 15:3 and the ceruleans PB 36, PG 50 from 240 to 200. The blue shade of pthalo green PG7 is at 180. M grahams permanent green light is yellower and Daniel Smiths sap green is an unsaturated yellow green close to the color of foliage. PBk 31 , perylene black is a very dull greenish black. This brings us back to the yellows. The paints with the same pigments can be marketed under different names so its best to look at the pigment numbers when purchasing them. The hues can vary slightly across brands depending on the manufacturing process. Hope this clears up some confusion about warm and cool colors. If we take yellow as the warmest hue then the hues containing it as the undertone are warm. The hue directly opposite this then, voilet blue , is the coolest. Some artists like to take the orange and blue green axis as the warm cool axis. 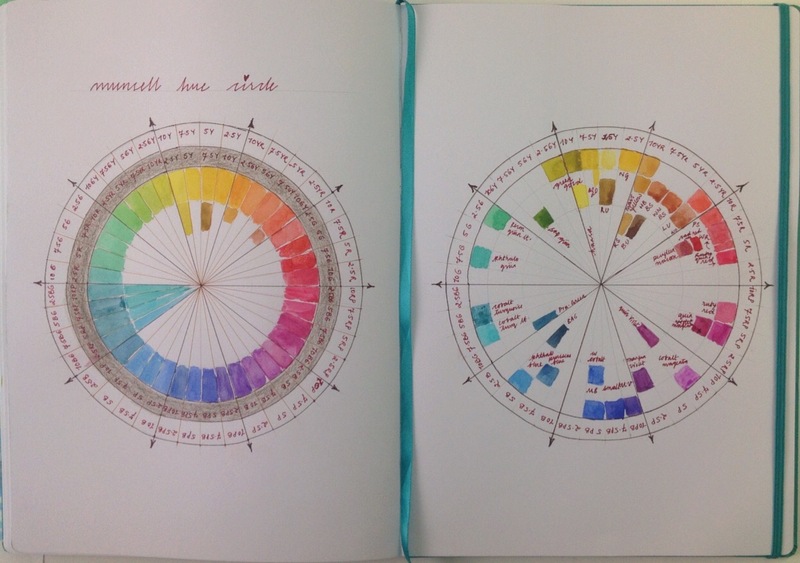 The value wheel shows the lightness of the same pigments, the scale also corresponding to the Munsell charts. The yellows at their optimal color are the lightest at a value of 9 and 8, the oranges and teals at 7 and 6 , reds and greens at 5, magentas and violets at 4 and the blues are at 3. Carbon black comes only to about a 2 and does not reach a true black at 0. Generally speaking, the colors, red, yellow and orange are called warm colors and the colors blue, green and violet are called cool colors. But it is important to realise that these terms are just a way of describing the colors and cannot be quantified, like, say the other properties: value (lightness/darkness) and chromaticity (saturation). So, it is not necessary to enter into the questions of which is the warmest or which is the coolest of colors etc. which no one is agreed upon anyway. [In fact, it is easier to think of colors as how much of each of the three hues, red, yellow and blue they contain rather than to think of them as warm or cool; but when conveying or describing them, I think the warm-cool concept is easier]. These terms are not absolute and make real sense only when talked of in a relative way. For e.g Schminke´s Ruby Red is (called) cooler than a Winsor and Newton´s Winsor Red but both reds are warm compared to any blue. You can have a warm and a cool yellow but both yellows are (called) warmer than any blue. Greens can be called warmer than blue because greens have yellow in them. A color that has more of red (or yellow) is said to warmer than a color which has more of blue. 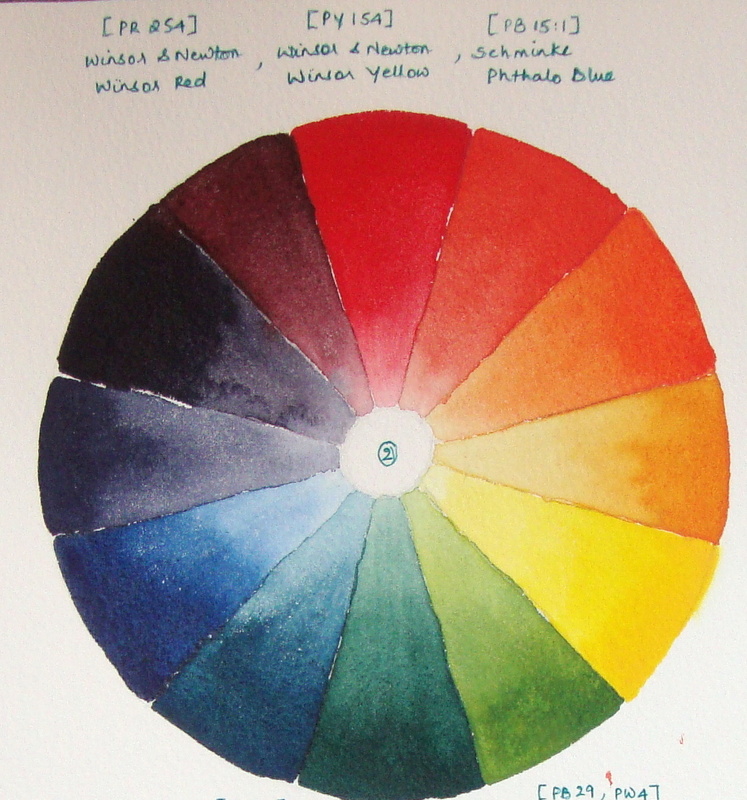 For e.g a Schminke´s Indian Yellow or a Daniel Smith´s New Gamboge both have a tiny amount of red in them and are called warmer than say, a Winsor and Newton Winsor Yellow. A very cool yellow has a tiny amount of blue, which gives the cool yellows a greenish tinge. An example of this would be Schminke´s Auerolin yellow. The reason why this concept is important is because it is a valuable aid in color mixing. If you want a pure, high chroma mix, then you should mix colors that do not have the opposite color in them (which would naturally dull the resulting mix). A cool red, for e.g has a small amount of blue, therefore it would not be a good idea to add this to a yellow, if you wanted a saturated orange. However, you can do so if you wanted a rusty kind of orange. A warm red plus a warm yellow gives a clear orange. A warm blue (ultramarine blue) and a cool red will give a clear violet. A cool blue (phthalo blue) and a cool yellow will give a clear green. 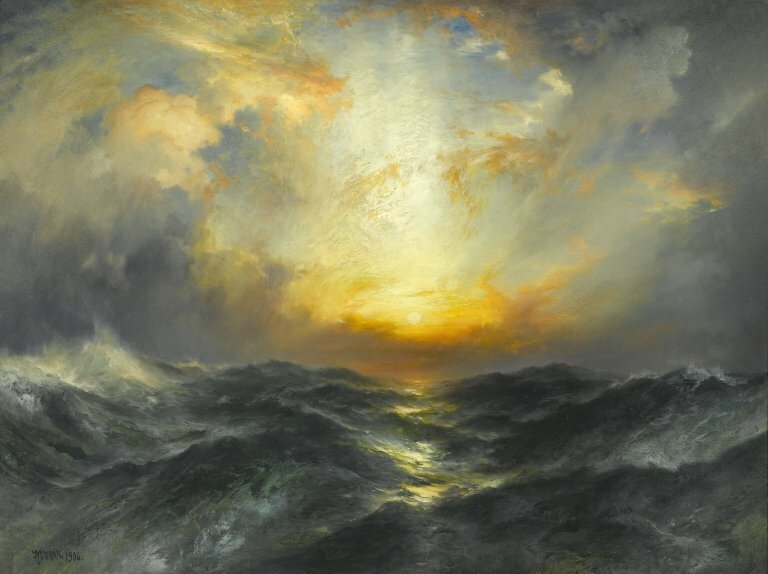 The colors around the sun are both warm and high chroma, yet the area does not advance unnaturally; it does attract the most attention, therefore it is used very effectively as the focal point and the reflection on the water as a path towards it. Definitely, it does look at a good distance beyond the foreground with the track and man walking, the trees catching the light delicately, the flying birds and the waters. 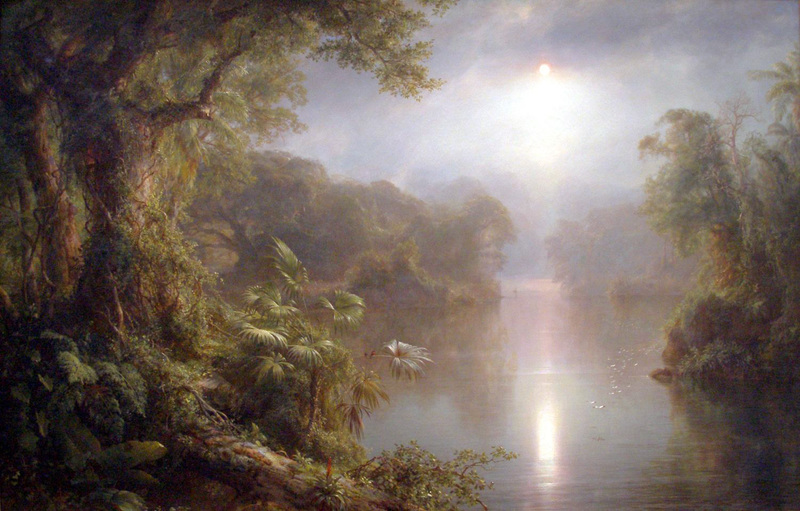 There are no predominantly warm colors in the background here, but it is of a higher chroma than the foreground, yet he has been successful in creating a marvellous amount of depth and distance (which is so necessary in landscape painting) in this work. Two, red-colored birds perched on a palm tree, which catches the light ever so beautifully, a red-flowering bromeliad on the path of brambles leading up to the roots of aged and gnarled trees form the exquisitely detailed foreground, the mid ground is formed by the slightly hazy trees and the white flock of birds just above the waters and beyond that are amorphous shapes for trees at the horizon. The foreground is quite cool, blue and bluish white, the shape of the iceberg leads the eye towards the midground which is quite warm, compared to the foreground, a beautiful green-blue which forms the focal point, the iceberg and the background behind that gets warmer(!) they have has touches of orange in it. 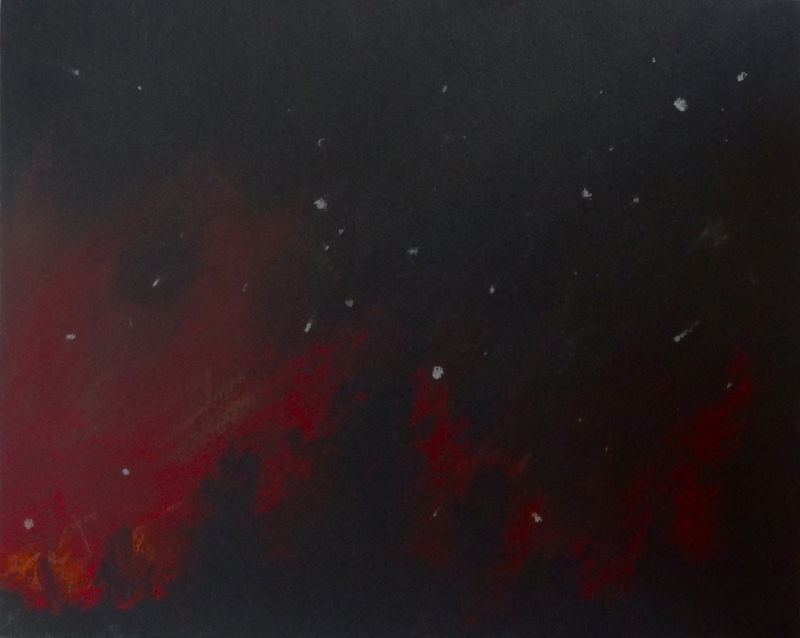 So, the painting gets warmer as it recedes, yet works beautifully. 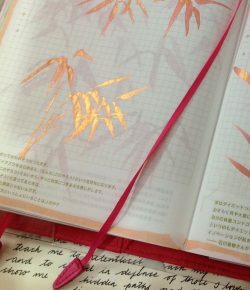 … It just makes me realize again how important it is to keep the mind free from strict rules. Posted in Beginner's cove, Color Theory, Warm and Cool colors	Tagged Do warm colors advance and cool colors recede? I find that a combination of alternate study and pratice is very effective when you are learning something. When you practice (paint), you come across some things that you donot understand and they are like small tensions in your mind, later you stop practicing and do some study ,research like going through art books or observing nature or doing little exercises such as value or color mixing charts for example, you open up your mind and let new things flow in and you will start stumbling upon the answers to what ever blocks you might have had….more research than required and you might end up whiling away your time! Back to practicing then….. When you buy your paints, choose according to what pigments the paint contains rather than accoding to the name of the paint. The pigment name is indicative of a particular hue and not its marketing name. 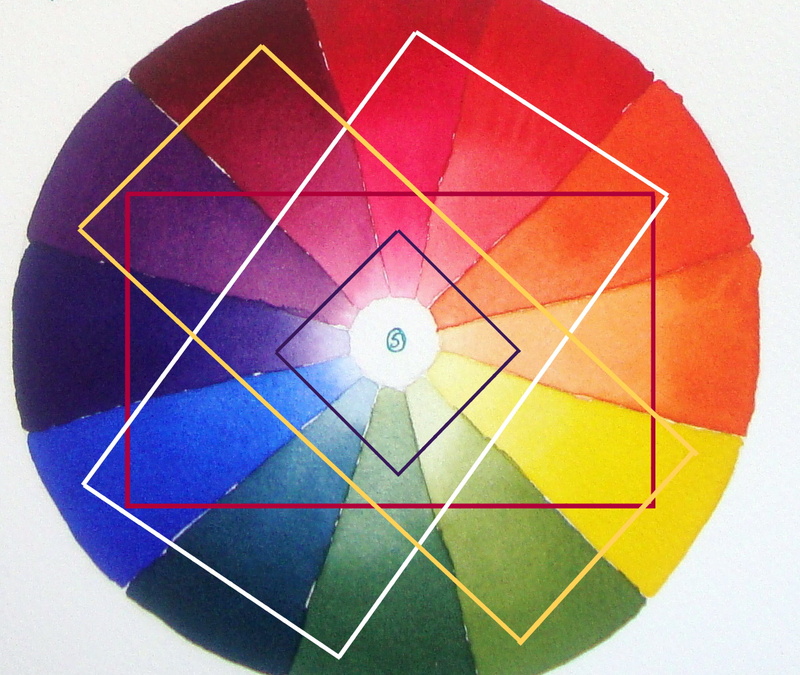 For e.g, The red in color wheel 1 is named ruby red by Schminke which has a pigment PV 19 (gamma quinacridone). 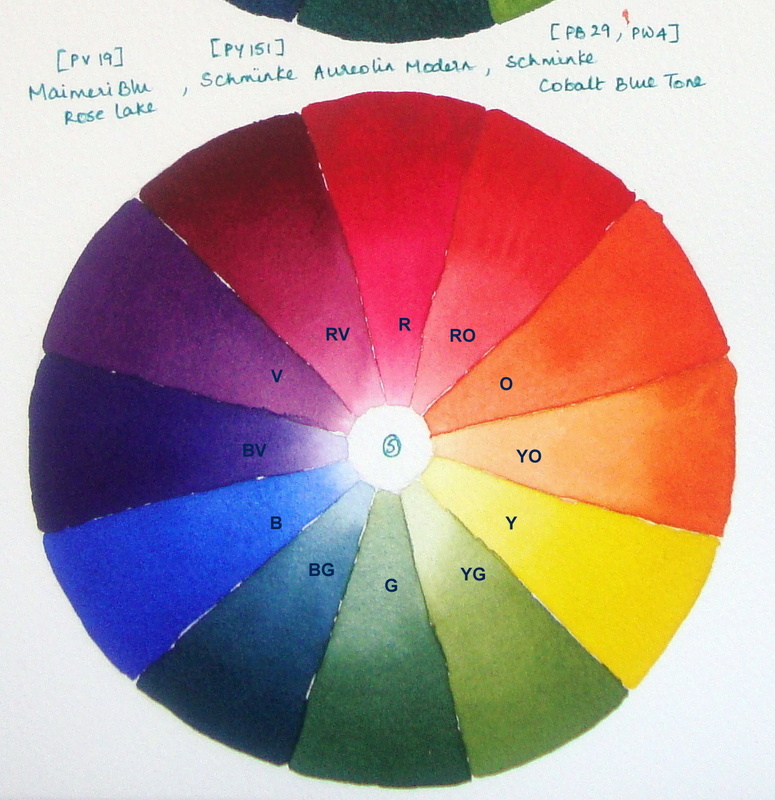 The red in color wheel 5 is also PV 19 but is named Rose Lake by its manufacturer MaimeriBlu. Sometimes there might be a difference in hue between two paints even when the pigment in them is the same depending upon how it is manufactured. 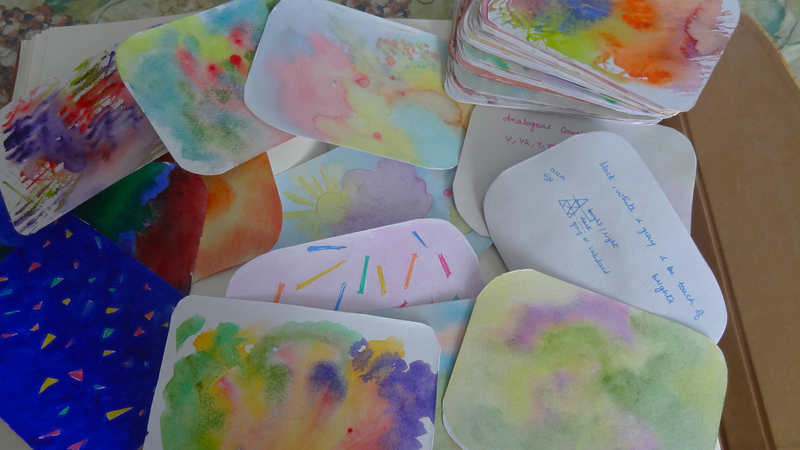 Paints that contain more than two pigments might result in muddy mixes. To make clear mixes, you should mix those colors that already have the resulting color in them. For e.g if you want a clean violet, choose a warm blue like ultramarine blue (which already has a bit of violet in it) and a cool red like ruby red (which also has a bit of violet in it). To make a clean orange, choose a warm red like winsor red (which has orange) and a warm yellow. For foliage, you donot need clean green mixes, they would look artificial (for e.g DS Hansa Yellow Medium and MG Pthalo blue) and you would have to dull them down with a red. Even if you`re careful with your mixes, the secondary colors that you get by mixing these primaries will not have a high chroma, i.e they will not be as intense as the secondaries that you can get from the tube. Usually this might not be so important, like in a landscape scene for example but if you`re painting flowers, you do need those saturated colors. To make the color wheels, draw a few circles each with 12 equal spokes. Paint your three primaries so that there are three empty spokes in between the pairs. The middle spoke in these three empty spokes is filled with the secondary color and the ones on either side of it have the tertiaries. Fill your brush with a nice and juicy almost full- valued color and paint a band at the widest part of the spoke. Dip the tip of the brush in clear water and paint this diluted color as a band in the middle area, stroke upwards gently to blend the two bands so that there is a gradation of values. Rinse the brush till almost completely clear and paint this pale tint from the narrowest part at the bottom and blend upwards. If you have this gradation from the full bodied color to its palest tint, it would be useful later on when you are painting to compare colors. It can be surprisingly difficult to distinguish between adjacent colors especially when they are very pale tints. This first wheel has S ruby red, DS new gamboge and MG Phthalo blue. It is quite a strong palette and I use this often. Ruby red is cool, it is actually a magenta and has some blue in it. This mixed with new gamboge which is a very warm yellow makes a not very saturated orange. But these RO,O and YO are still interesting and I add another secondary color Schminke translucent orange to brighten these mixes if required. Since the blue is cool (has some yellow in it), the resulting violets are also not that saturated, I would add a mauve or a purple from the tube to these mixes. A warm red would be another useful additional color if you`re painting red flowers. The yellow and blue make great greens however. This warm yellow has some red in it, so these greens are toned down and are perfect for foliage. In the second color wheel, the warm winsor red and winsor yellow (neither warm nor cool) make beautiful oranges. But both the winsor red and phthalo blue donot have violet in it, so the the resulting mixes are neutrals rather than violets. The greens are good. I would choose an additional cool red and warm blue. In fact, you can make a color wheel like this, where you have both warm and cool primaries (placed side by side) where you`ll always have clean mixes. Clockwise direction > A cool red next to a warm red which is mixed with a warm yellow placed next to a cool yellow which is mixed with a cool blue placed next to a warm blue which is mixed with the warm red. 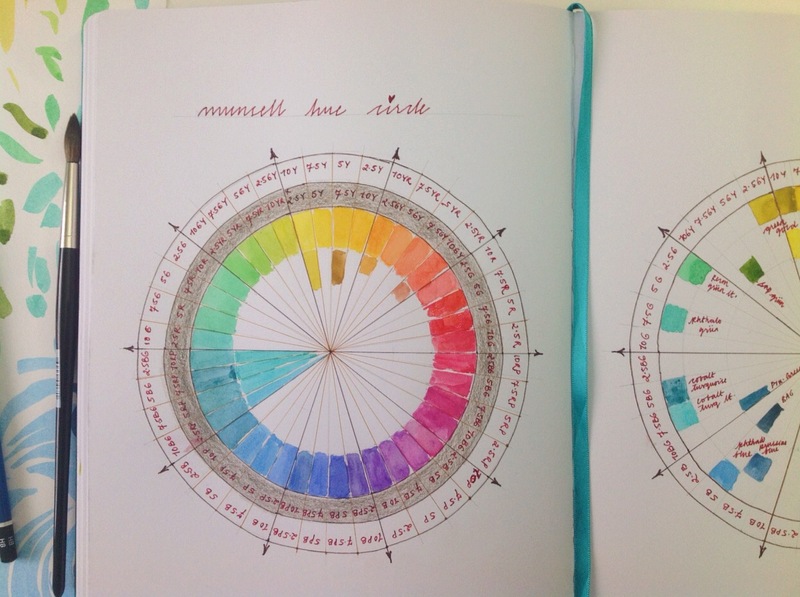 The same is the case with the third color wheel, beautiful oranges but neutrals on the violet side. DS prussian blue is a bit opaque but gives interesting dark valued shadow greens. This fourth color wheel has beautiful clear mixes throughtout. Very close to the CYM color model. The primary is a magenta, so the secondary color is a blue violet, that mixed with the magenta gives the tertiary color violet. The primary hue, Cyan, mixed with BV gives blue! Magenta mixed with RO (secondary, here) gives red! You would probably need an additional warm red here, though. This fifth wheel has the best mixes. Even though the rose lake is quite cool, the orange is still quite saturated. The warm blue makes clean violets. These three primaries would be sufficient for a painting. The ultramarine blue in this sixth wheel is the warmest of the blues here but does not make too great violets mixed with S permanent Karmin. The lemon yellow is the coolest of all the yellows here. The greens have texture to them beacause of the ultramarine blue which is sedimentary. I put some masking fluid to save the whites for the water droplets. Don`t leave it on for more than 2-3 days. The lower flower has quin red , quin red mixed with new gamboge (to get a red orange), perylene maroon for the shadows, also a bit of ultramarine blue and ruby red. It is yet to open fully and is warmer than the upper one which has the same colors but more of ruby red. Perylene maroon may look very bright with a burnt orange hue while it is still wet, but gets a lot more dull towards a maroon shade after it has dried. If you`re having trouble with values, start out with painting a single flower or leaf with a single color from a black and white photo. Choose any dark valued color so that you can make use of the maximum number of values. A yellow will not give you the complete range. Any deep red or blue will work. Make a value scale with the color from 1 to 9 or from 1 to 5 if thats all you can differentiate for now. 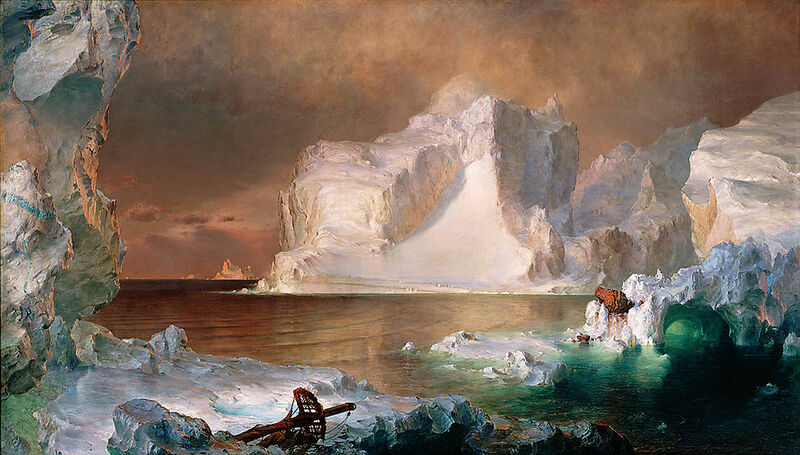 There`s a section on this in Beginnier`s cove > color theory > values. Wet a petal with clear water, let it sink in a bit while you determine which the lightest value is on that particular petal in the photo. It can be a 1 or 2 or 3 if its a sunlit petal but also in the higher range if it is in shadow. Lay that value in, determine what the next value is and lay that (the mix will be stronger now) on the first wash but not completely covering it. This wash will gently flare on the first one giving a soft edge if you have the right amount of moisture both on the brush and the paper. (u will get better with practice). You can continue doing this with the next values all the way till the darkest. But if the petal has reached the damp-dry stage before you have complete it, stop and let dry completely while you work on another petal. Later, make another wash of clear water and start putting in the darker values. If you are confident you have got the hang of this, do the same flower with the full set of colors. Choose only the three primaries if you have a problem with color harmony. The red closest to the flower, a yellow to warm it and a blue for a cooler hue. Lay in the lightest values, but which color is that lightest value? Is it a bright red-orange, a red, a red tending towards violet or a dull red tending towards maroon? You can`t go wrong if you`re careful at each stage. Slowly you will realize you`re making color choices instinctively and without fuss. Have fun and good luck……. Hi Karen, I wanted to answer to you in this post so that it would be useful to others too. Two of the notations in the chart are from Schminke’s watercolors brochure. I’m quite happy with my schminke colors but I wanted more hues so I opted for other brands. My first criteria was lightfastness, the next important property was transparency. These are from Daniel Smith, Winsor and Newton, M Graham and Maimeri Blu. 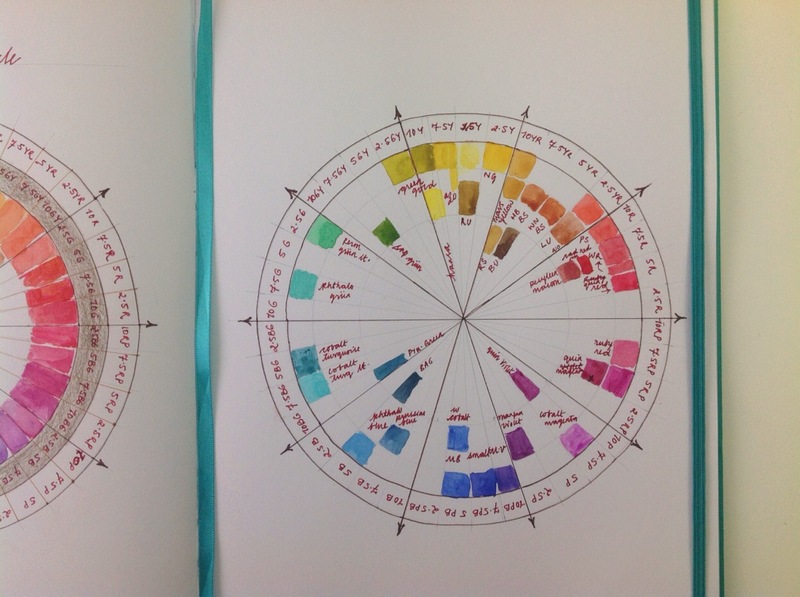 A reader of this blog has written to me asking for a larger version of my color chart. It is rather smudged, (I like to blame these type of things on my son) Srishti, hope you can read the names this time. There are no sharp value changes nor too many values in the blue Iris that I have been working on. They are so close together that I thought it would be well worth the time to make a value chart to observe its range more closely. Here is a quick intro on values for anyone of you who are a bit unsure on this. Any color basically has three properties, hue, value and chroma. The hue is the name of the color like yellow ,red, blue etc. Value is the lightness or darkness of a color. Chroma is the intensity or saturation or how ‘bright’ we perceive the color to be. In nature there are an infinite number of colors and values but we have to reduce them to something that we can manage in our art. A minimum of 3 values is required to define a form – the highlight, where the sun rays directly hit the object which makes the color of the object look paler than it actually is, the mid value which can be the actual color of the object and a dark value on the opposite side, which is in shade and therefore looks darker and duller than the actual color. To make the object look more realistic, however, we need to use more values. When you look at a black and white photograph, you are looking at the values without the hue. This gray scale version can be useful in determining the value of a color without the color distracting you. You can make a black and white photo from your reference photo with any image editing software, like Picasa which is free to download. Here is a 9 scale value chart that I have made (the topmost row) with a mix of delft blue and walnut brown to get a black. If you have trouble distinguishing between adjacent values, try a 6 scale value range. It’s easier to do it at first with a 6B pencil than in watercolors because of the drying shifts in watercolors. The blackest black you can make with a pencil is the sixth value and the white of the paper is the first value. All the values in between have to get darker progressively towards black. You can make a chart of the most used colors in your palette in rows of one inch squares on a watercolor sheet, starting with a black or any dark color for reference. You will see that for some colors like yellow and oranges, you cannot get to the other end of the value range. The color that you see straight from the tube is the maximum value that you can get from that color. By diluting it with water step by step , you can get the values down to 1. Some colors like dark blues and browns go the entire way from 1 upto 9. In the three colors above, indian yellow , ruby red and phthalo blue you can observe an interesting fact. (I forgot to leave a white square at the beginning of each color) The yellow looks most intense at value 3, the red at 3 and 4, the blue at 3. Colors at their maximum chroma stand out in a painting and you need to be careful about where you place them. Though knowledge of values and chroma and their use in a painting is very important; I feel that this develops in us instinctively through regular practice rather than through a detailed study. Anyways, getting back to my iris, I made some swatches to match colors as this is a very light valued flower and both the color and the value has to be got just right at the start, as there is not much need of glazing here. I felt the pale blue was tending towards green and so I tried mixing pthalo blue with a yellow and a green on the top row but I was wrong. It was tending towards red, mixing it with ruby red in the first two coloumns of the second row was the right color but looked dull, in other words the chroma was not at its best. I got it right in the next three coloumns by mixing pthalo blue with magenta. The third row consists of ultramarine and cobalt blue, I might use them to add interest to the painting. In case you are a little vague about your primaries and secondaries, you can start understanding them by building your own color charts. The three primary colors are red, yellow and blue. When you combine two primaries, you get the secondary colors. Red and yellow gives orange, yellow and blue gives green, and red and blue gives purple. When you combine all the three primaries, you get a grey or a neutral color. When you combine a primary with a secondary that is made with the other two primaries, you will get a neutral color beacause, basically all the three primaries are present in the mixture. For e.g when you mix yellow (primary) with purple (secondary made with the other two primaries, blue and red), you get a neutral hue. This yellow – purple pair is called a complimentary pair. Similarly, the complimentary of red is green and the complimentary of blue is orange. You can get pleasing neutrals, if you use single pigment transparent colors when mixing. These neutral colors can be pushed towards muted grayed pinks, reds, blues etc by favouring those colors in the mixtures. These can be used as shadow colors, for dried foliage, walls, stones etc. Reds and yellows are warm colors and they appear to come forward while blues and greens are cool colors and they appear to recede away from you. Observe trees in a wide open space. The trees near you will look greener (green has yellow in it which makes it warmer than blue) , with increasing distance away from you, the trees look more and more bluish-grey. In fact, towards the horizon, all the elements on that line are sort of merged into a uniform bluish gray with no detail to tell one element apart from the other. 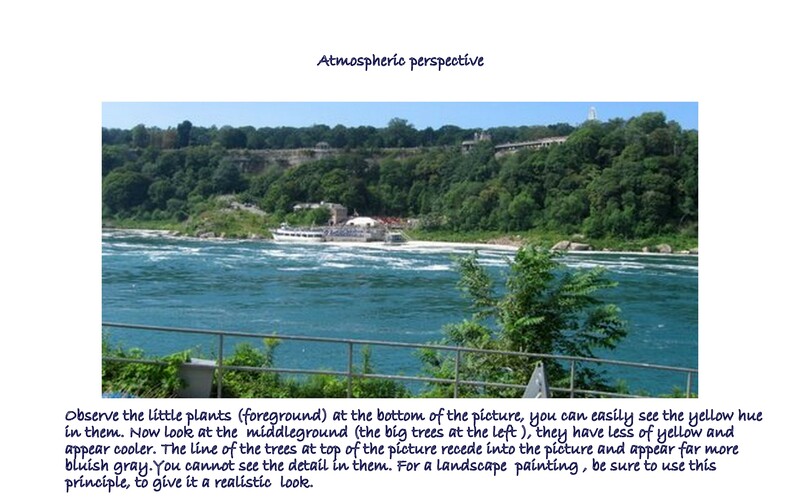 This is called atmospheric perspective. 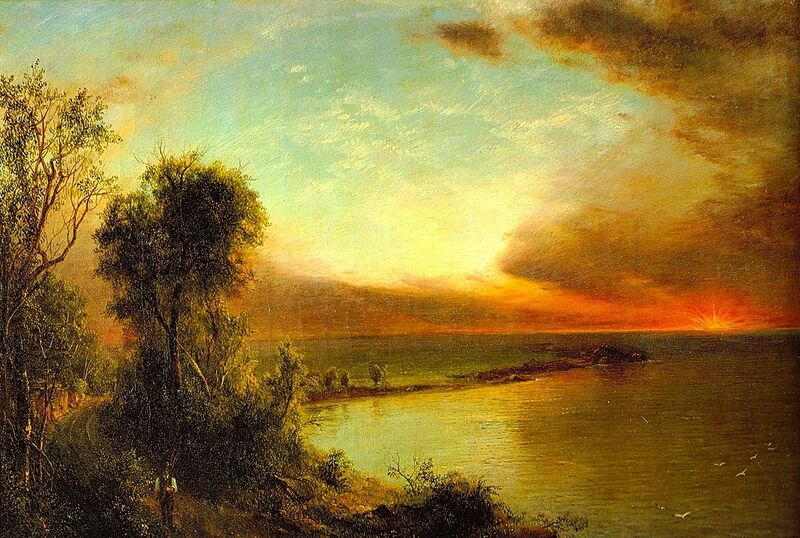 In a painting, you translate this reality by using mainly warm colors in the foreground and cooler colors in the background. The foreground elements should have more detail and get fuzzier and fuzzier as you move towards the horizon. Take a red from your palette and add very little blue to it (donot make it into a purple). Take the same red in a separate well and add very little yellow to it (donot make it into an orange). Now paint these colors in two swatches next to each other. The first red which has a blue tinge in it is cooler than the second red which has an yellowish tinge in it. Thus, even though red is a warm color, the first red is cooler than the second red. You can paint this cooler red (my making it a little more muted by adding its complimentary) into the distance in the background without making it look as though it is coming forward or sticking out. 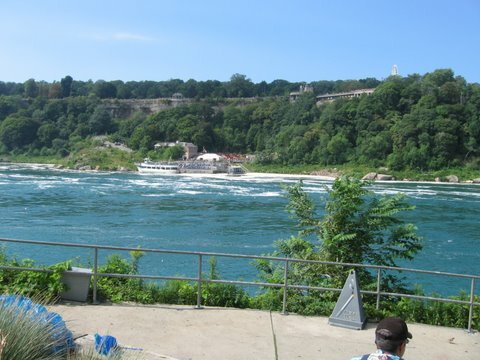 Observe the two reds and see if you can make out that one appears to come forward while the other recedes. It helps to paint these swatches one above the other (the above one being smaller) rather than next to each other. In the same way, you can have a warm blue when you compare it to a true blue which does not have red in it. The colors that you get from the manufacturer contains warm versions and cooler versions of a single color. When mixing, if you want a bright color, see that both colors are either warm or either cool. If you want a slightly muted color, you can mix both warmer and cooler colors. 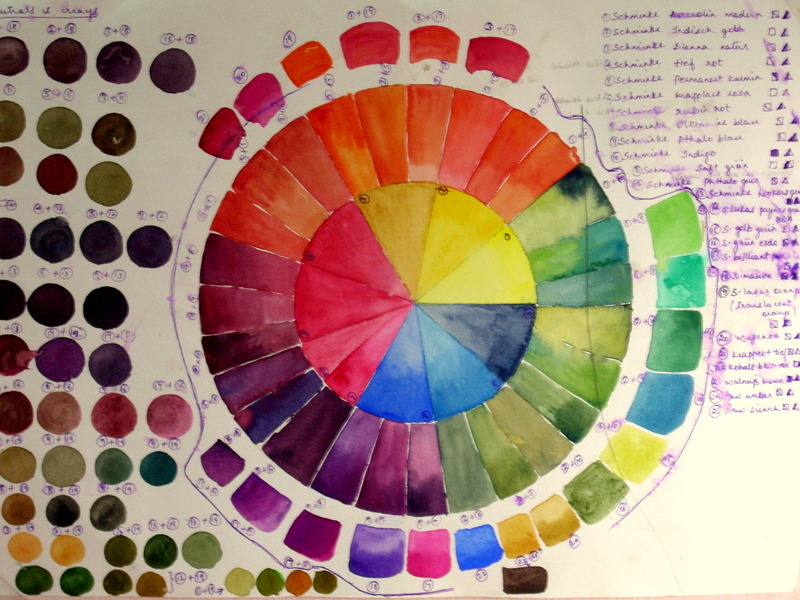 It helps a lot to make your color charts with the colors that you have. Here are two that I have made with Schminke colors: the first one consists of auerolin yellow (neither warm or cool), dark red (bluish) and ultramarine blue; the other triad is made of indian yellow (warmer than aeurolin because it has some red in it), ruby red (which tends towards pink) and pthalo blue (warmer, has a little yellow). The colors donot come up accurately on the monitor, try doing your own charts. You really cannot see much difference in the primaries on the monitor, though there is a discernable difference in reality ……..see how different the secondaries are; You can make beautiful violets with reds tending towards pink and warmer blues as seen in the second triad. 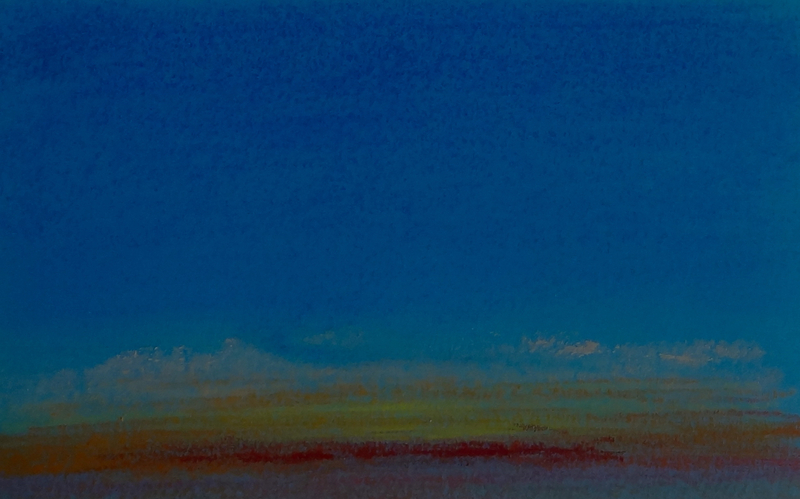 In the first triad, a deep purple is formed by a bluish red and ultramarine blue. Make a chart with all the colors that you have and see what mixes that you come up with. You can use this as a reference for your paintings. The inner circle consists of the store bought primaries and the circle enveloping that are the secondaries formed by mixing these primaries. The outermost colors in the scattered circle are store bought secondary colors.